The term “public finance“ may be defined as the identification of specific financial relationships and functions running between public administration bodies and institutions (i.e. public sector entities – the state) as one party and in mutual interaction with other entities of the economic system as the other party (i.e. private entities – households and companies). Directing entities existing in the economy towards socially desirable behaviours; for instance through taxes, penalties, subsidies and other stimuli and charges. In order to arrange the funding of the above-mentioned areas, there is a fiscal system (public budgeting system) whose aim is to collect the required amount of public revenue. Public revenue serves, at various levels of public budgets (governmental, regional and local), to fund public expenditures. Public expenditures, public revenue and particularly taxes may be considered to be the fundamental elements of public finance. Important terms derived from these three elements include deficit, public debt, budgetary policy and fiscal policy. The development of public finance is connected with economic mechanisms that should ideally lead to the effective and fair allocation of limited resources. The reason for developing public funding is the state intention to soften the drawbacks resulting from economic decisions made by individual entities (households and companies). It uses fiscal tools (public revenue and expenditure) to accomplish this. Certain behaviour is classified as the “quasi-fiscal funding principle”, where publiclaw goods are funded from off-budgetary resources (e.g. the public-law television in the Czech Republic is funded from television licence fees). Another important term that relates to public finance, and that is also a strong argument for its development, is market failure. The market system follows supply and demand through the price mechanism. It is a system that has developed itself, and that has strong ties with the interactions between people and companies. All these entities strive to maximize their benefit (welfare). The greatest benefit is strongly interconnected with reaching the economic optimum condition. A system that reaches the optimum is considered, in the neoclassical economics concept, to be efficient, fair and stable. The ideal condition is called the Pareto optimum. This exists in an economy when none of the involved entities can improve its position without worsening another entity’s position. If any of the entities intends to improve its position, it is possible for it to do so only to the detriment of another entity. The existence of perfect competition is a necessary requirement for reaching the optimum. The three above-mentioned elements (efficiency, stability and fairness) are connected with microeconomics from the viewpoint of efficiency, connected with macroeconomics from the viewpoint of stability, and connected with sciences outside economics from the viewpoint of fairness. The perception of fairness is investigated by other social sciences, and is closely linked to ethics, etc. If no conditions exist for reaching a market-efficient solution, or the conditions are simply violated for any reason, market failure will ensue. The distribution of wealth and income may diverge from the consensus on fairness. 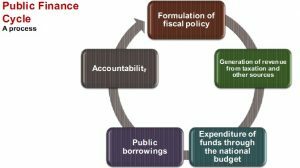 It is then up to the state to perform its fiscal function (the public finance function) in those three areas in order to preferably eliminate or at least reduce market failure. Specifically, those are microeconomic failures from the allocation function perspective, macroeconomic failures from the stabilization function perspective, and the redistribution function then falls into the area of market failure caused by outside economies. If the conditions for perfect competition are not met, a malfunction in the price mechanism will arise, which disturbs the allocation mechanism. Some failures can be eliminated without public finance intervention through auto-regulation (the internalization of externalities). However, others are part of the government’s allocation function and its fiscal tools (taxes and governmental purchases or transfers). Macroeconomic failure is indicated by instability in the economic system that usually suffers from cyclical inflation, a high rate of unemployment, low or even negative growth of production or problems in the foreign trade balance, etc. The above-mentioned macroeconomic cases of instability are why governments perform the state stabilization functions (stabilization fiscal functions). The state uses several tools to perform the stabilization function. The basic classification is a division into monetary and fiscal tools. The monetary tools include open market operations, the setting of basic interest rates, determining the level of mandatory minimum reserves, etc. Fiscal tools may include public expenditure, public revenue and ways of funding deficits. The causes of market failure outside the economy relate to reaching fairness in society through the distribution of wealth and income. With the distribution of wealth, the market does not practically perceive fairness. In this case, the state performs a redistributive role with 5h3 principles of solidarity, social conscience, charity, etc. based on the social consensus. The state performs the redistribution function through two basic categories of tools. The first includes revenue (tax) and the other expenditures (transfers, grants and subsidies). First, a tax transfer mechanism may be implemented through a combination of progressive taxation of high incomes and transfers (subsidies) in favour of low income households. Secondly, this can occur through the taxation of luxury goods combined with subsidies on goods for the low-income population. Though the ultimate aim of fiscal policy in the long-run stabilisation of the economy, yet it can be achieved by moderating short-run economic fluctuations. In this context, Otto Eckstein defines fiscal policy as “changes in taxes and expenditures which aim at short-run goals of full employment and price-level stability. To maintain and achieve full employment. To stabilise the price level. To maintain equilibrium in the balance of payments. Revenue Expenditure increased by 7670 crore (15 per cent) during 2015-16 over the previous year, mainly due to increase in expenditure in Economic Service Sector (3362 crore), Social Service Sector (3679 crore), General Service Sector (530 crore) and disbursement of Grants-in-Aid and contributions (99 crore). Capital outlay increased by 6015 crore (54.31 per cent) over the previous year, mainly on account of increase in expenditure on Roads & Bridges (3106 crore), Power Projects (802 crore), Irrigation (1088 crore) and Animal Husbandry (`184 crore). Public Debt receipts increased by 2144 crore (28.04 per cent) while repayment of public debt decreased by 1230 crore (29.92 per cent). Public Account receipts (31098 crore) increased by 6297 crore (25.39 percent) over the previous year, mainly due to increase in Small Savings and Provident Fund (617 crore), Reserve Fund (1275 crore) and Deposits and Advances (357 crore) and Remittances (4084 crore), which was set off by decrease in Suspense and Miscellaneous (36 crore). Public Account disbursements (28766 crore) on the other hand, increased by 6255 crore (27.78 per cent) during the same period. Cash Balance of the State increased by ` 2055 crore. The Thirteenth Finance Commission (ThFC) had recommended that every State needed to amend the Fiscal Responsibility and Budget Management (FRBM) Act and work out a fiscal reform path to make credible progress towards fiscal consolidation. Revenue deficit during 2011-12 and onwards to be maintained at Zero. Fiscal deficit to be contained within three per cent of the Gross State Domestic Product (GSDP) from 2011-12 and onwards. In order to bring the debt stock to a sustainable level, interest payment as a percentage of Revenue Receipt to be limited to 15 per cent. For the purpose of ensuring compliance with the provisions of the FRBM Act, the State Government shall entrust an agency independent of State Government who shall periodically make review of such compliance and submit reports thereof to the State Government for laying the same before the State Legislature. The Gross State Domestic Product of Odisha for 2017-18 at current prices is estimated to be Rs 4,12,481 This is 8.8% higher than the revised estimate for 2016-17. Total expenditure for 2017-18 is estimated to be Rs 1,06,911 crore, a 14.3% increase over the revised estimate of 2016-17. In 2016-17, there was a decrease of Rs 538 crore (0.5%) in the revised estimate over the budget estimate. Total receipts (excluding borrowings) for 2017-18 are estimated to be Rs 89,062 crore, an increase of 1% over the revised estimates of 2016-17. In 2016-17, total receipts exceeded the budgeted target by Rs 1,857 crore (2.37%). Revenue surplus for the next financial year is targeted at Rs 6,694 crore, or 1.6% of the state Gross Domestic Product (GDP). Fiscal deficit is targeted at Rs 14,435 crore (3.5% of state GDP). Departments of Housing and Urban Development, School Education and Water Resources saw most increase in allocations for the year 2017-18. On the other hand, the Panchayati Raj Department saw a marginal decrease in allocation in 2017-18. Irrigation: 2.95 lakh hectares of agricultural land to be provided irrigation in 2017-18. Rs 1,546 crore has been allocated for Parbati Giri Mega Lift Irrigation Scheme. UNNATI: A new scheme, Urban Transformation Initiative (UNNATI) is proposed to be implemented to improve urban roads and provision of civic amenities. Rs 294 crore has been allocated for the scheme. Medical education: Rs 400 crore will be spent on establishment of new medical colleges to increase the availability of doctors. Buxi Jagabandhu Assured Water Supply to Habitations (BASUDHA): An outlay of Rs 315 crore and Rs 750 crore respectively is budgeted to be spent for urban water supply and rural water supply under the program. Integrated Financial Management System (IFMS): Odisha’s public expenditure management system, IFMS which provides for electronic receipts and disbursements will be further upgraded to ensure entire chain of financial transactions becomes digital and paperless. Revenue deficit: It is the excess of revenue expenditure over revenue receipts. A revenue deficit implies that the government needs to borrow in order to finance its expenses, which do not create capital assets. However, the budget estimates a revenue surplus of Rs 6,694 crore (or 1.62% of state GDP) in 2017-18. This implies that revenue receipts are expected to be higher than the revenue expenditure, resulting in a surplus. The estimate indicates that the state is within the target of eliminating revenue deficit, prescribed by the 14th Finance Commission. Fiscal deficit: It is the excess of total expenditure over total receipts. This gap is filled by borrowings by the government, and leads to an increase in total liabilities of the government. In 2017-18, fiscal deficit is estimated to be Rs 14,435 crore, which is 3.5% of the state GDP. The estimate reaches the 3.5% limit prescribed by the 14th Finance Commission. Debt Stock: It is the accumulation of borrowings over the years. As of 2017-18, the debt stock is expected to be 18.6% of the state GDP (Rs 76,744 crore), which is an increase from 16.4% in 2016-17. The debt stock is estimated to be 19.7% of state GDP in 2017-18 and further increase to 20.7% in 2019-20. Increase in debt stock over time indicates increasing interest payment and principal repayment burden in the future. In addition to these liabilities, the state has provided guarantees to loans of other entities worth Rs 2,256 crore.